Muldoon and Joyce Mills were among the Skypark's first residents. His death in September of 2001 was a loss not only to Joyce and the Skypark family but to the world at large. What is written below is only a pale whisper of his life. 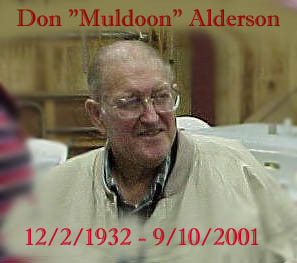 Don Alderson was born in Honolulu, Hawaii on December 2, 1932. His parents were teacher/missionaries and Don's early memories were of an idyllic time when Hawaii was still a quiet, simple place where a barefoot boy could run with the wind. Following Pearl Harbor the family moved to Los Angeles, where Don spent his teenage years, attending Newberry Park Academy High School. Like many boys of the period, Don worked at a local gas station. In those days you could get a learner's permit at the age of 13½ , in preparation for which he purchased and rebuilt a Model A roadster. From that point onward he always owned a Model A, sometimes two or three at a time. After high school, Don attended La Sierra College in Riverside, during which time he began his formal racing connection at the old Santa Ana drag strip, now the Orange County airport. In 1951 he transferred to Walla Walla College in Washington state to work toward an engineering degree. During this period, Don and a friend built up a T-bucket roadster, towed it from Washington state to Santa Ana during Christmas vacation and ran it to a top speed of 109 mph. However, in 1952 the Korean War interrupted and Don found himself in Korea, serving appropriately as NCOIC of a motor pool operation. War is hell, but when he reminisced Don always preferred to relate the inevitable wild and cocky things which accompany young men at war. Ending his two-year Army stint, Don returned to California and a job at Schrillo Tool Engineering in Los Angeles. At Schrillo's he was privileged to go through a very complete apprenticeship in design and manufacturing of aircraft components and assemblies. Rising to the position of Shop Foreman, Don built and oversaw assembly of aircraft subsystems such as cabin pressurization units for the DC-6, 7 and 8 aircraft. In 1957, Don and his friend Milo Franklin determined to branch out on their own and in November of that year formed "Milodon Engineering, Inc". Initially, Milodon was primarily an aircraft and missile job shop. However, automobiles and automobile racing were always close to Don's heart, and gradually Milodon began to produce a few items which went primarily into Don's own cars and engines. Don was by then fully involved with Bonneville racing, 1/4 mile drags and Dry Lake Bed racing. Don was an active member of the Gear Grinders, a major club within the Southern California Timing Association (SCTA). In 1956 Don drove his street roadster to a record speed of 131 mph. When fellow racers inquired about the source of a special part and received Don's reply "I made it", the inevitable request was "next time you make one, make me two!". This demand accelerated a drift at Milodon from aircraft components to automotive product development. Quantities of "special parts" grew from batches of three or four to dozens and finally to thousands. In 1962 Don acquired sole ownership of the company, and soon Milodon was a full time race engine part manufacturer. The products grew from support items such as beefed-up main bearing supports, oil systems, oil pans and the like to major products such as 426-Chrysler and 350-Chevy style aluminum blocks manufactured specifically for racing engines. Wins by Chris "Crazy Greek" Karamesines and Don Garlits in Milodon-engined dragsters made the company a byword. By 1985 Milodon had 42 employees and a product line of some 900-plus items. For Don, the '60s were the glory years of racing. In 1965, Don's engines powered the Herda, Knapp and Milodon streamliner. Bob Herda was the driver of the streamliner and in Don's estimation the best aerodynamics guru in the automotive racing business. Running both big-block 460's and smaller 299's allowed the car to compete in both Class B and Class C. The streamliner rolled to a Bonneville record on it's first outing. Over the next three years the car broke it's own record 18 times, eight times in a single year. In 1967 the Ford Autolite division contacted Don and asked if he would build up a special SOHC engine to run in the streamliner in November of 1967 as a special tribute to Henry Ford's record breaking runs at Daytona Beach 40 years earlier. The deadline was met, and the streamliner's final best speed of 357+ mph set that November was to stand as a class record for an incredible 28 years. While automotive racing was Don's first passion, his love of speed quite naturally attracted him to a parallel involvement in the world of aviation. Although he had started some flight training in 1951 and progressed to soloing in a J-3 Cub, he never received a license. Then in the mid-1960s, an old buddy who was an ex-military flight instructor seduced Don into purchasing a WW-II era T-6 trainer and Don resumed flight training, passing his private pilot check-ride on October 14, 1966. Becoming unsatisfied with the speed and performance of the 600-hp T-6, In May of 1969 he moved to an 800-hp T-28 which he flew until it suffered an unspecified "taxi accident" at VNY on March 29, 1970. Not surprisingly, after a year's rework during which he was "downgraded" to flying a Bonanza, the T-28 reemerged with an upgraded 1200 HP engine (later boosted to 1425 & finally 1625-hp). The T-28 kept Don's need for performance at bay for several years, but finally he moved up to every young boy's testosterone-fuelled dream, a P-51 Mustang. Quite naturally, all this interest and activity within the performance aviation field led to supplying parts for many major air-racing names. Special machining, gearbox mods and the like went into such record-setting aircraft as Darryl Greenamyer's Bearcat & F-104 Starfighter, and Ed Browning's highly modified P-51 Red Baron. In addition to the ex-military heavy iron, Don also owned & flew a string of more "normal" aircraft, such as Twin Beeches, a Baron and several Bonanzas. An interest in T-34 trainers led eventually to the purchase of two T-34's and connected Don with Earl Parks of Parks Industries in Amarillo, TX, for whom Don made special castings and parts used in Earl's restoration of T-34 aircraft from all over the world. Don remained very active in the T-34 "community" until declining health finally dictated otherwise. In 1986 Don sold Milodon and moved to semi-retirement as one of the original residents of the Rosamond Skypark north of Los Angeles. Semi-retirement, in addition to flying the Bonanza and the T-34s, meant the formation of Muldoon Engineering to manufacture and market a limited line of automotive performance products and "special" items. These items were marketed under the Muldoon Engineering name and also as "no-name" and/or major-name branded products and were well respected in the performance industry. Don's contributions to motorsports and the automotive performance industry have been honored numerous times by many organizations that are household names in the field. The National Hot Rod Association (NHRA) and the Special Equipment Marketing Association (SEMA) have both honored Don with awards at their conventions. Posthumously, Don was selected for the Dry Lakes Racing Hall of Fame by the Gold Coast Roadster & Racing Club. Capping the list, a blue-ribbon selection board has tapped Don for induction into the International Drag Racing Hall of Fame, founded by racing great Don Garlits. Don was a large man in both body and spirit, and he lived a life to match. He described himself as a "horribly impulsive man". Perhaps, but the impulse this writer saw was to live the best and most rewarding life he could. And that ain't so bad.